Archaeologists working in Megiddo have unearthed an incredible 25 layers of settlement built on top of each other that cover a period of 35 centuries. 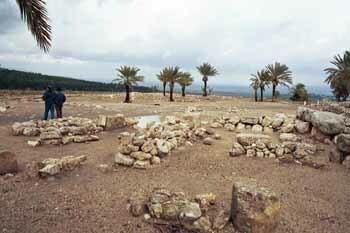 The city of Megiddo dates back roughly 8,000 years. The city ceased to exist after the Persian invasion of Palestine some 2,300 years ago and, today, nothing is left but the ruins of what once was a regional administrative and military center during the reign of King Solomon. Megiddo's long history is related to its strategic position overlooking the Via Maris, one of the main routes used for travel between Egypt, Syria and Mesopotamia. The city is referred to in the New Testament as Armageddon, a name St. John derived from the Hebrew for Mount Megiddo, Har Megiddo. According to the book of Revelation, this the place where the last great battle will be fought when the forces of good will triumph over evil. To give a sense of the size of the community, when King Thutmose III of Egypt conquered Megiddo 3,500 years ago, he left with, among other things, 1,929 head of cattle, 2,000 goats, 20,500 sheep, 204 horses, 200 army uniforms, 502 bows. 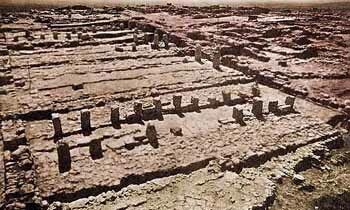 The first people to inhabit Megiddo arrived during the Neolithic period. A watershed period occurred in the 20th century B.C.E. when it became a fortified city-state. Egypt later dominated the area then known as Canaan and massive walls were built around the city, which indicate Megiddo had become wealthy and required protection. The first written reference to Megiddo; indeed, the first recorded battle in history, is a detailed account of the 1479 B.C.E. invasion of the Egyptian Pharaoh Thutmose III. The city subsequently became a center of culture and politics. 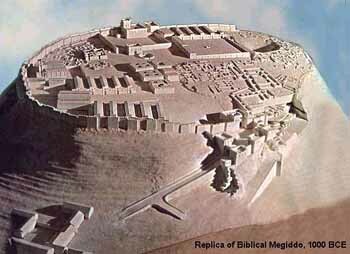 Megiddo is first mentioned in the Bible in Joshua 12:21. At the time the city was inhabited by Canaanites. The city later came under the control of King Solomon, though there is some controversy as to how much of a connection he had to the remains that have been discovered. The Israelite connection to the city ended around 732 B.C.E. when the Assyrians conquered Palestine. Though the city was destroyed and rebuilt several more times, it gradually declined in significance. Most recently, Megiddo was the place where British General Edmund Allenby launched his attack against the Turks in 1917. It also served as a base for Israeli forces in the 1948 war. One of the interesting parts of the excavation is the chariot stables, called Solomon's Stables even though we now know they were built by King Ahab during the 9th century B.C.E. The only parts that remain are the posts where the horses were apparently tied and troughs. A grain silo dates from the reign of King Jeroboam in the 8th century B.C.E. Today, water is considered vital to the security and survival of Israel. That this has been true since ancient times is evident in many archaeological sites throughout the country, including Megiddo. Here, an ingenious system was devised so the townspeople would not have to leave the safety of the city walls to collect water. A vertical shaft was dug within the city to the depth of the nearby spring and then a tunnel was built connecting to the water source. 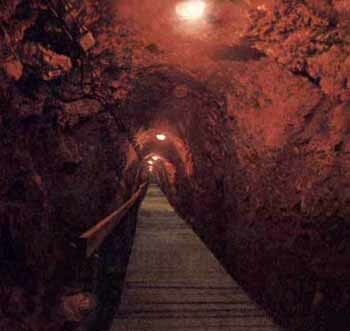 You can walk down 183 steps into the shaft, which is 120 feet deep, and then along the tunnel, which stretches another 215 feet. The city of Megiddo was designated a UNESCO World Heritage site in 2005.